While the content of your resume critical, the format plays an important role as well. You may have exceptional experience, results, and expertise, but if employers can’t quickly find what they are looking for, you run the risk of being overlooked. A resume that is packed densely with blocks of text, has no real differentiation between sections, and is unappealing to the eye can leave a less than stellar impression. Bring your resume to life by implementing some strategic formatting so that it looks more professional and engaging. Make contact information visible. While your name and address shouldn’t be the most prominent part of your resume, you do want employers to know who you are. Make your name slightly larger than the rest of your contact information and keep everything together so that it is easy to find. Avoid putting this information in the header or footer as these sections may be cut off by applicant tracking systems. Segment using horizontal lines. Clearly define each section with a concise title and use horizontal lines for separation. This allows hiring managers to quickly scan for the information they need. It also helps to draw the reader’s eye from section to section and reduces confusion. Use bolding strategically. Bolding should not be all or nothing, but it should be consistent. Some good places to use bolding are to highlight the company and position, years of employment, awards, degrees, and professional affiliations. 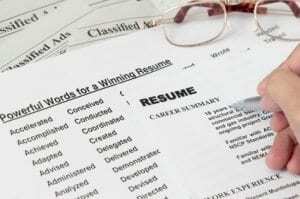 Try to avoid bolding individual words or phrases throughout your experience as this can take away from the overall impression and leave your resume looking messy. Key skills can be emphasized in your core competencies section. Break up information into bullet points. Hiring managers don’t want to spend the time reading through a long paragraph to try to discern your qualifications or abilities. Use bullet points to draw attention to your achievements. Each bullet point should highlight key information and be clear and concise. Avoid colors, fancy fonts, and graphics. Not only can these make your resume more difficult to read, they will likely be stripped by applicant tracking systems anyway. Stick with a traditional font in size 11 or 12. Going too small can make your resume look cluttered with information and be difficult to see. Graphics are unnecessary, can appear unprofessional, take up value space, and can throw off spacing and formatting on your resume. Forgo templates. Personalize your resume as your own rather than plugging in information as you go. Delete tables and instead use tabs, indenting, or columns to create the look you desire. This can provide a more professional look and also show that you took the time to craft your resume rather than using a generic template you pulled offline. Customize your resume to fit your experience and abilities. Are you ready to revamp your resume and give it an updated look and feel? The team at Chic Resumes can help you do just that while also ensuring that you have high quality content and keywords to match. Boost the appeal of your resume by presenting it in a format that is clear, concise, and easy to read while drawing attention to your diverse experience. Contact Chic Resumes at (803) 831-7444 or resumewriting@grammarchic.net to liven up your resume today.